Congratulations to Tina for being our Ray of Sunshine for the beautifu card she created for her frien's birthday. Be sure to go check Tina's blog to see her other lovely creations. I am sure she would love to read your comments. Tina please feel free to grab our badge & paste to your blog. 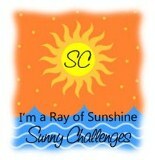 Once again, thank you Tina for playing along with us here at Sunny Challenges & Creations. There is only 2 more days left for the current challenge. We would love for you to play along with us. Thanks so much for the honour of being chosen as your Ray of Sunshine. I'm thrilled, and I hope I can find the time to play along again soon.